Diana Ferguson of Diana Ferguson Jewelry makes a gorgeous line of Petals to the Metal Jewelry. Her process is painstaking... first, Diana creates a digital pattern or collage, then prints it on cotton rag watercolor paper, cuts petal shapes, applies glossy enamel, and assembles the shapes with anodized aluminum petals and findings to create intricate clusters. The result is original wearable art that is as light as a feather. 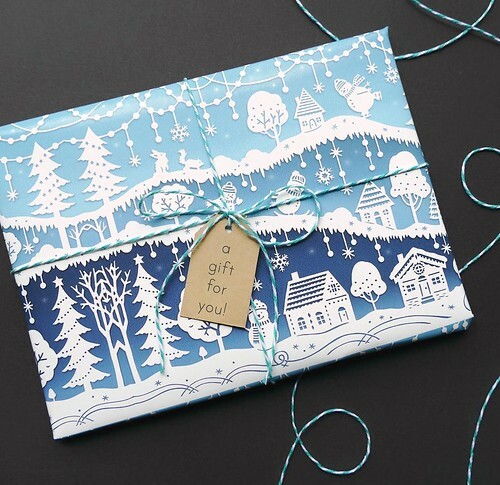 Lotus Stewart of Girl Friday Paper Arts creates the prettiest statement art I've seen anywhere. I'm especially fond of her gold foil prints. Whether you pop one in a frame for a friend or hang a trio over your desk, you're bound to feel happy and inspired. Find more than two dozen foil options including Kindness is Magic, Oooooh La La, Keep It Simple, and Paris Is Always a Good Idea in the shop. She also offers nursery/kids wall art, as well as options for your office, kitchen, and living space. Lynda Millar of Island Lines is a papercut artist with a brand new Etsy shop this holiday season. 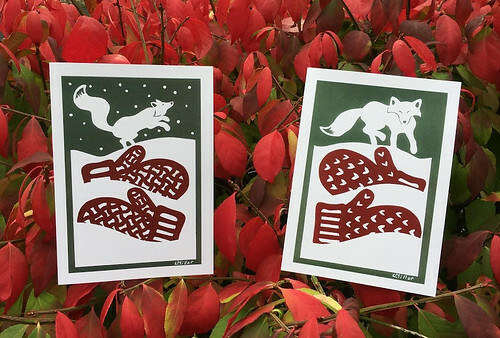 Her clever mitten cards that feature a variety of snowy background scenes speak to her Maine location. You'll also find partridge and pear ornaments, framed dimensional papercuttings and more. 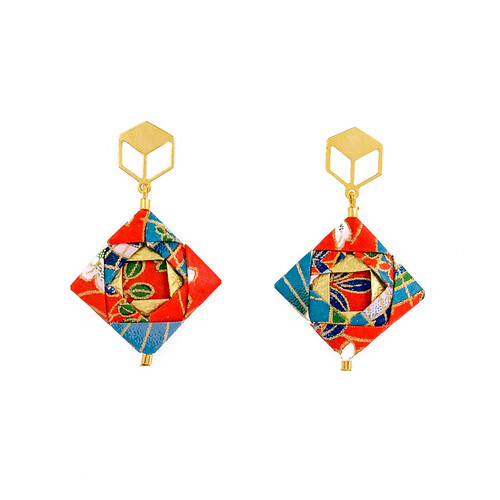 Renata Mayumi of Mayumi Origami combines folding skill, high quality decorative papers, and attractive 24K gold plated brass or 925 silver plated brass findings to create stylish origami jewelry. 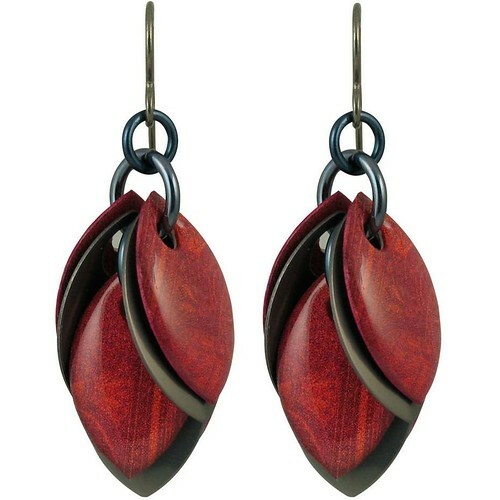 She coats the intricate folds with several layers of non-toxic, acid-free varnish for water resistance, yet the earrings and necklaces still have the lovely look of natural paper. Sarah Trumbauer brings a special touch to detailed papercut designs. I'm crazy about this cheery Snow Day cutting that is available as a print, holiday card, and two-sided tree ornament. 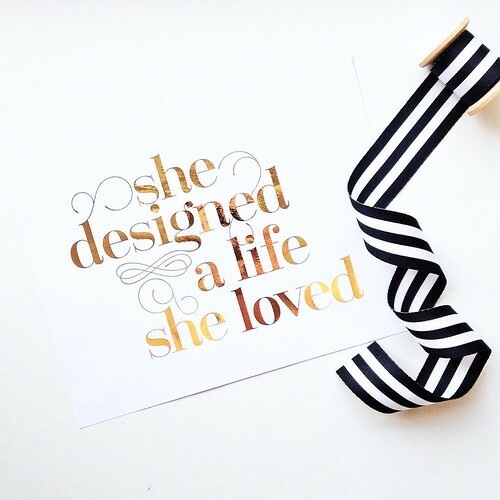 In addition to a 2018 calendar, Sarah offers original papercuts, personalized prints that are so cute as wall art in a child's nursery or bedroom, elegant papercut jewelry, notebooks, magnets, and greeting cards. Receiving a package from Sarah's shop is a real treat. Stefani Tadio of Stefani Tadio Paper Art combines two loves - paper and stitching - to make hand-embroidered mandalas and more. 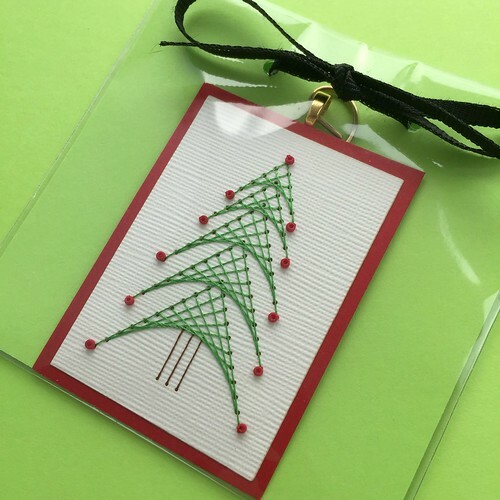 She uses sturdy cardstock, high-sheen thread, seed beads, and crystals to create colorful framed art, notepads, jewelry, ornaments, and paper craft kits. 10% off in the shop with coupon code AllThingsPaper. 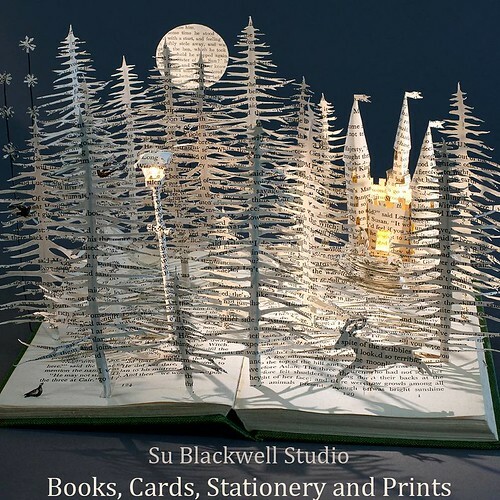 Perhaps you're already aware of the amazing altered book art by UK artist Su Blackwell, but did you know she has an online shop stocked with artist books and catalogues, high quality prints of her beloved paper sculptures, as well as greeting cards and stationery that feature images of her work? Have a browse. Vicki Smith is an illustrator who creates popular animal masks for party photo booths and storytelling, as well as calendars, art pins, toys, templates, and cards. I've sent Vicki's Christmas cards several years in a row and adorned packages with her fox and dear Scottie dog tags that are available as printable downloads... everyone loves them! Note: A paper jewelry giveaway from VERSO Studio is underway on the blog and Instagram through Saturday, December 2. You could win a $50 gift certificate to spend on any item of your choice. Have a great weekend! Lynda Millar is my sister in law and she’s an amazing artist. She does such amazing work. Wish she would add all of her creations to her Etsy store! 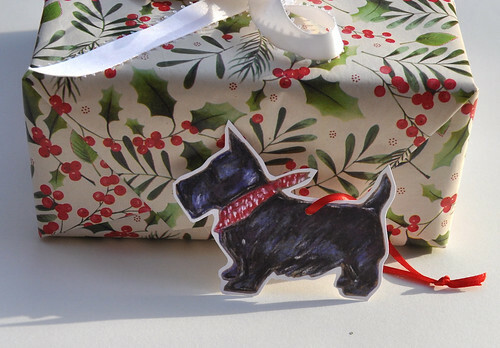 Thanks Ann for including my scottie dog in your round-up! Roy, how nice of you to comment. I look forward to seeing more of Lynda's work. Lynda, it was my pleasure!